As all good students of Paulo Friere know, literacy isn’t simply about reading print words in sentence order. 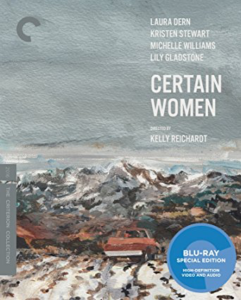 “Reading” means “reading the world.” So this week, for your reading pleasure, I offer a flim: Certain Women, written and directed by Kelly Reichardt. After I saw this film, I thought about it for weeks. I’m still thinking about it, flashing occasionally on an image or a snippet of dialog, sometimes smiling, sometimes shuddering. It wasn’t love at first sight. I was annoyed to be at the movies. I shouldn’t have accepted the invitation. Being there would make me get home from town after dark. I’d come to town to do laundry, the last laundry before winter, mostly bedding. I’d left the chore to the last minute—the post-last minute, actually, because my quarter-mile driveway was already blocked with snow. I would have to run the laundry up the hill in the wheelbarrow. All of that ahead of me, and there I was watching this movie. At first I thought something sinister was going to happen, which annoyed me. Instead, nothing happened, or at least nothing that wasn’t ordinary. One boring ordinary thing after another happening to a string of boring ordinary people keeping me stuck in that boring movie until after dark when I still had so much to do. I have been every single woman in that movie. I set down the wheelbarrow and looked at the sky. I thought about laundromats, wall tents, winter light, and the determination it takes to make something happen. I remembered rushing up a stairway with a dog, dressing for the weather, smoking when no one was looking, waking up with the wrong shadow on the wall. I remembered feeling capable. I remembered being in way over my head. “It gave me a lot to think about,” I told an English-professor friend a few days later. He began to sigh out some wistful sentence about Montana and landscape. “Oh, Montana Schmontana!” I blurted, startling even myself, remembering the bleary sheen of night sleet on I-90, and what it’s like to be out there with bad wipers and bad tires, chasing love, money, and respect. Here’s what I found most interesting: I went to see a movie that reflected myself back to me in every frame. And the whole time I was watching it, I was annoyed.